...[B]ecause we were identical twins so easily spotted in the crowd of grimy, exhausted Jewish prisoners, Miriam and I had been chosen. Soon we would come face to face with Josef Mengele, the Nazi doctor known as the Angel of Death. It was he who selected those on the platform who were to live and those would die. But we did not know that yet. All we knew was that we were abruptly alone. We were only ten years old. So begins Eva Mozes Kor's account of her journey through the Auschwitz concentration camp, Dr. Mengele's experiments on her twin and herself, and their determination to survive even when all hope seemed lost. Identical twins Eva and Miriam Kor were ten years old when they arrived at Auschwitz. Separated from the rest of their family, they clung to each other for survival. A survivor's story is a precious resource and this is one that shouldn't be missed. The book strikes a delicate balance between providing details of Eva's experience and keeping it age-appropriate. 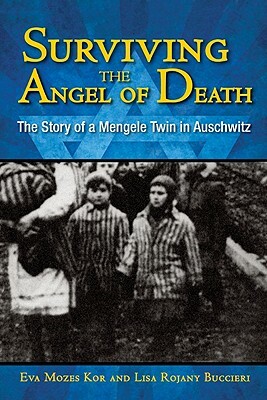 Although the book doesn't go into great detail about all of Mengele's experiments (understandably, since 10-year-old Eva would have had no idea what was going on), this is a story told from a unique perspective. Even teens who have read widely on this subject may find new information here. The writing is functional and gets out of the way of the story, which is perfectly appropriate. Lisa Rojany Buccieri helps Eva Kor get her story across to its audience. Photos of Eva's family and of Auschwitz are included, as well as an author's note. Eva Kor started the CANDLES Holocaust Museum in Terre Haute, IN to commemorate her experience and the experiences of other Holocaust and Mengele survivors. Hand this one to your teens who are fascinated by Anne Frank or the Holocaust. Surviving the Angel of Death is on shelves now!